Sometimes clogged pipes cause a reduced water flow at one fixture or entire section of a structure. When I am called to solve such a problem, I often back flush the pipes rather than taking them apart to clear the blockage. First I confirm that the problem is caused by a clogged pipe in the system and not a faulty fixture. The first thing I want to do is remove any aerators that could be plugged, or see if only one side of a fixture has the problem. If I find low flow on only one side of a faucet, or more than one fixture is involved, I set up a back flush. Here are a few views of my preferred tool for stopping the flow at a faucet spout. These toggle on or off aerators were handed out by our local power company years ago as a way to reduce hot water consumption. Of course most of them were never installed. I find them for two bits at garage sales and always have one on the truck for back flushing. Close the service valve at the water heater. Now the hot side of the system is under no pressure. Remove the aerator at the fixture with the low flow, Let's call this fixture #1. Plug it, for this I use the toggle aerator pictured above. Alternately put a dime or a piece of paper towel in the aerator to stop the faucet from passing water then replace the aerator and open the hot side of the fixture. Now go to the hot fixture in the house that has the largest, most difficult-to-plug water passage. This is fixture #2. Open it fully, on the hot side only. Also plug the drain of fixture #2 so you can inspect what debris you flush before it can go into the drain. This will be a laundry sink faucet, or an old-style tub valve. The idea is to give the debris you are back flushing a good place to exit the system. Return to fixture #1 and open the cold side. Listen to the water to determine if there is flow. If the plugged aerator is holding and you can hear cold water flowing back though the hot side go and inspect what may be exiting the system at fixture #2. You will want to see a good flow of water. If you don’t, go back to the problem faucet, #1, and open and close the hot side several times. You can also go to faucet #2 and open and close it's hot side several times. After you have run a few gallons of water in this way, undo what you have done, that is turn off the cold water at the problem faucet #1. Remove the plugged aerator. Also turn off the hot water at the problem faucet #1 and turn the water heater valve back on. You have left the hot side of faucet #2 on so that it is the direction the water will flow when you open the water heater valve. Go see if any debris has exited the system. Turn off faucet #2 and go check the flow at faucet #1. If the flow is improved and you have flushed debris out of the system you can stop now. Or you can repeat the steps again to see if you can flush out more debris from your clogged pipes. Between flushes open the drain at fixture #2 and wipe it clean. Then plug it again so you can keep track of new progress. Back flushing the cold side is done the same way but you will need an outside source of water. You'll close the main water valve instead of the water heater valve. A neighbor’s hose valve will work, but be sure to use a new potable water hose. 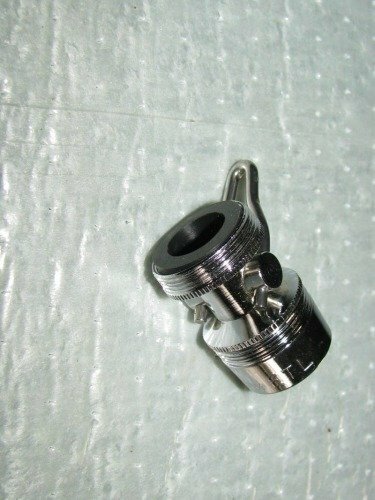 You'll also need a hose-thread to aerator-thread adapter. Some valves (modern pressure-balanced tub and shower valves) cannot be back flushed as they are equipped with internal check valves. 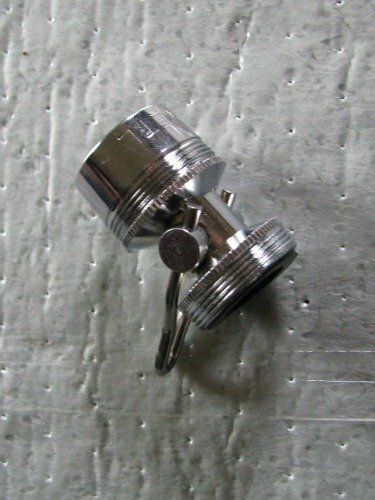 Back flush a tub and shower valve by putting a threaded cap where the shower head is and setting the diverter. Note: this may lock the diverter in place. If it does, remove the threaded cap. This trick doesn’t work for all clogged pipes, or for all types of fixtures, but it does work. I have used it many times especially to clear rust from faucets and lines. I am always looking for the least invasive way to make my repairs.